First published in 1973 – and followed by Volume II in 1976 and Volume III in 1980 – this anthology has assumed classic status in the field of Egyptology and portrays the remarkable evolution of the literary forms of one of the world’s earliest civilizations. 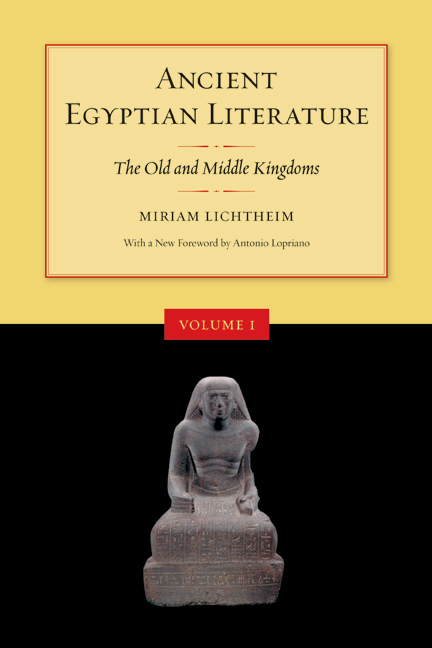 Volume I outlines the early and gradual evolution of Egyptian literary genres, including biographical and historical inscriptions carved on stone, the various classes of literary works written with pen on papyrus, and the mortuary literature that focuses on life after death. Introduced with a new foreword by Antonio Loprieno. Volume II shows the culmination of these literary genres within the single period known as the New Kingdom (1550-1080 B.C.). With a new foreword by Hans-W. Fischer-Elfert. Volume III spans the last millennium of Pharaonic civilization, from the tenth century B.C. to the beginning of the Christian era. With a new foreword by Joseph G. Manning. For thirty years Miriam Lichtheim was Near East Bibliographer and Lecturer at University of California, Los Angeles. She retired in 1974 to devote herself to Egyptological research and later moved to Jerusalem where she taught at Hebrew University. She died in 2004. Antonio Lopriano is Professor of Egyptology at the University of Basel, Switzerland.